”I signed up for CRAFT of Teaching expecting to learn a few hot tips and tricks. In the past I have taken similar programs on teaching and effective presentations. As an educator m in Vancouver and 12 years behind the chair I know the fundamentals. In two days we covered a lot of ground, which I loved. Some of my biggest take-always were: learning to adapt on the fly, building the components of a lesson plans to achieve flow, creating an opening with a punch and understanding the learners in your room and the 7 micro expressions to better assess my students. “Craft of teaching… what an amazing class it was! “I met Tanya in Toronto in spring of 2017 where she talked to me about her coaching program. I really thought at the time that I could handle a business and be behind the chair, so I did not give it much thought. However, last year I realized that running a salon and being behind the chair was just too much, so I reached out to Tanya for help. Since I’ve started my coaching, Tanya has been able to help me identify and focus on my weakness and keep me accountable for the goals we have set together. This has been an incredible help to me as I am now able to track my salon numbers, know key performance indicators, and how to better manage my time. In addition to this, she has helped me with my communications skills with the staff in the salon and help me develop new way to keep staff engaged and excited by setting out personalised goals for each individual team member. We have seen more enthusiasm from staff and an increase in pre-booking by 50%, retail sales by 20% and treatments by 5%. I am over the moon with these results! Susan Whalen - owner Salon Kokoro. Calgary Alberta. “My experience being mentored by Tanya Sullivan has been nothing short of exceptional. She was one of my first mentors 13 years ago, where I was taught everything from colour theory to building myself as a business, with tips and tricks along the way. Kara Firman - owner Guide Salon. Saskatoon Saskatchewan. “I have known Tanya for 15+ years. 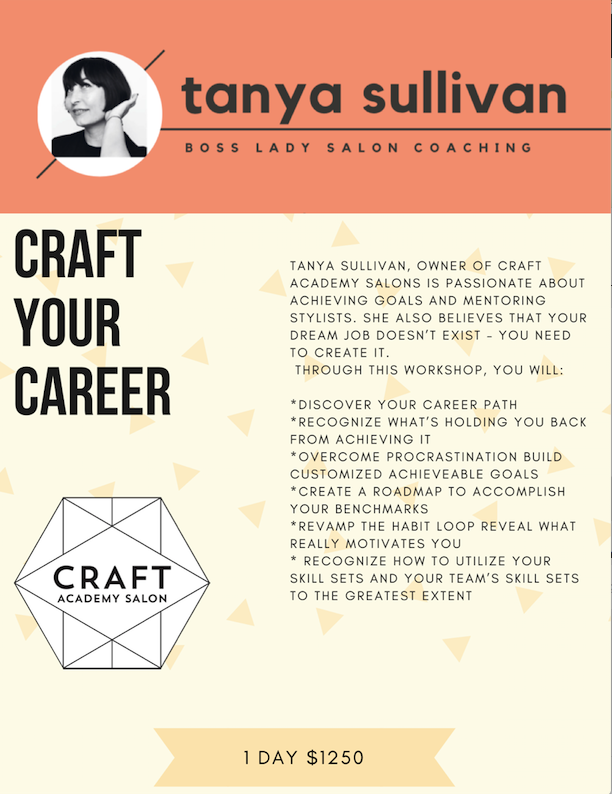 In those years Tanya has been a point of reference as a hairdresser, a trainer, and as a mentor. As a hairdresser, she has both vision and skill. As a trainer she is open and focused all wrapped up in humour and fun. And as a mentor-with empathy, intuition and leadership Tanya leaves people reflective and engaged in their own success. Georgia Reynolds - Stylist/Colourist & Beauty Coach Untitled Salon. Toronto Ontario. Anna Giannini -Stylist/Colourist Untitled Salon. Toronto Ontario.